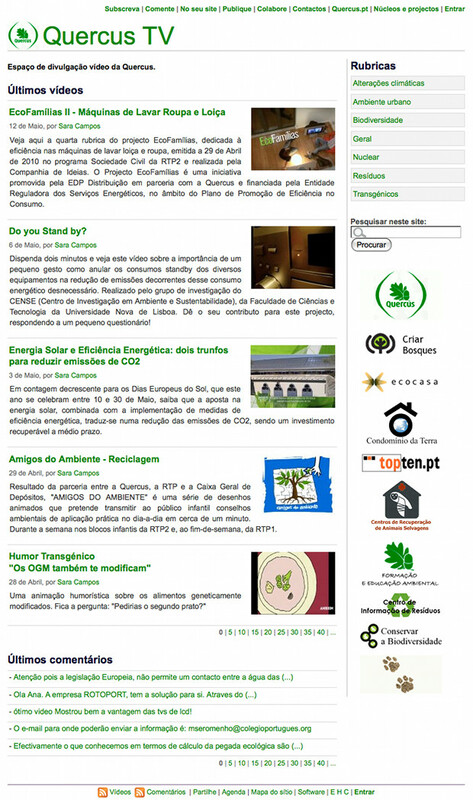 Quercus is the largest environment NGO in Portugal. Quercus TV is their video website. Currently this website has about 250 videos and it’s visited by 350 to 500 visitors a day. I’ve started this project from scratch in the beginning of 2007. After the initial set-up, I’ve worked in Quercus TV it as an editor until October 2007, when I went to the Netherlands to work for Greenpeace. In January 2009 I’ve redesigned the site, with the current design. Today I still update the content management system with security fixes, add new features and provide technical support to the current editor.